A beautiful morning gives way to a miserable and bitterly cold afternoon, the wind whipping down the avenues of Berlin as drizzle falls in the ever encroaching darkness. It may be nicer in general to be out of doors, but sometimes a refuge is needed, whether it is the bookshop, the pub, a café or the living room. I choose Café Hilde on the corner of Prenzlauer Allee and Metzer Straße, a sanctuary of flickering candles, gentle music and good books to browse on the shelves. I leave the books where they stand and pull out my collection of Berlin maps. 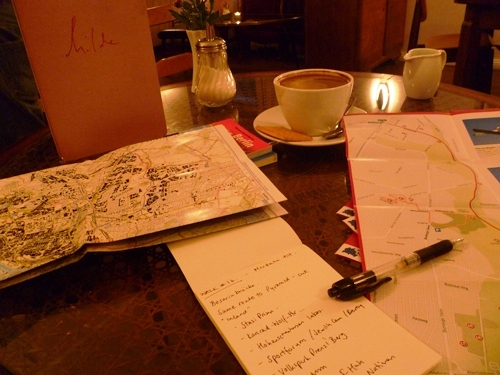 I am plotting routes, imagining destinations, over first a coffee and then a beer. The café remains calm, as if we are still in the dead period between Christmas and New Year. It is quiet too, as every customer is by themselves; he is reading a book, her face is illuminated by a laptop screen, and an unseen figure around the corner is rustling a newspaper as the coffee machine hisses. This entry was posted in Miscellany on January 4, 2012 by Paul Scraton.